Last major update issued on January 6, 2004 at 04:45 UTC. The geomagnetic field was unsettled to active on January 5. Solar wind speed ranged between 569 and 700 km/sec under the influence of a high speed stream from coronal hole CH74. Solar flux measured at 20h UTC on 2.8 GHz was 123.0. The planetary A index was 22 (STAR Ap - based on the mean of three hour interval ap indices: 22.0). Three hour interval K indices: 43334444 (planetary), 44333433 (Boulder). At midnight there were 2 spotted regions on the visible disk. Solar flare activity was high. A total of 6 C and 1 M class events was recorded during the day. Region 10534 decayed in the trailing spot section while slow development was observed in the leading spot section. Region 10536 developed with the most significant change occurring in and near the southeastern part of the huge main penumbra. In this part a magnetic delta structure formed. Further M class flares are possible. Flares: C7.5 at 00:16, C5.0 at 00:58, a major long duration M6.9/2N event peaking at 03:45 (associated with a moderate type IV radio sweep and at least a partial halo CME), C2.9 at 10:15 UTC. An interesting region is about to rotate into view at the northeast limb near the equator. 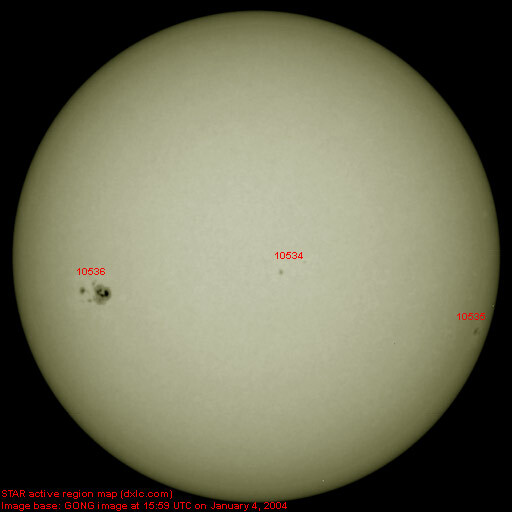 This region was the source of a C2.6 long duration event peaking at 20:21 (at the peak of this event there was some activity in the western part of region 10536 as well), a C4.2 flare at 21:12 and a C1.7 flare at 22:42 UTC. January 3-4: No partly or fully earth directed CMEs observed in a data set with a few samples only. January 5: A fairly large partial halo CME was associated with the major M6.9 long duration event in region 10536 early in the day. Material outflow was observed over the east limbs and the southwest limb in LASCO images several hours after the event. Earth will likely receive a sideways glancing blow on January 7. A recurrent trans equatorial coronal hole (CH74) was in a geoeffective position on January 1-5. This coronal hole has decreased significantly in size over the last rotation, mostly due to the development of region 10534. 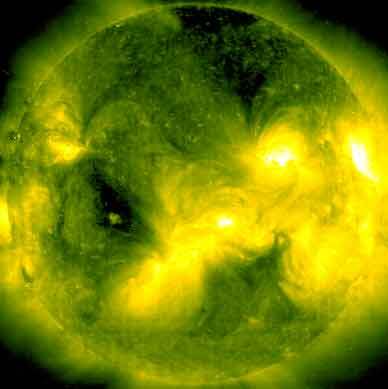 The geomagnetic field is expected to be unsettled to minor storm January 6-7 due to a high speed stream from coronal hole CH74. The CME associated with the M6 LDE early on January 5 could cause active to major storm conditions on January 7 and 8. Long distance low frequency (below 2 MHz) propagation along east-west paths over high and upper middle latitudes is very poor. Propagation along long distance north-south paths is fair to good. [Trans Atlantic propagation conditions are currently monitored every night on 1470 kHz. Dominant stations tonight: Radio Cristal del Uruguay and Radio Rafaela (Argentina). Several strong signals from Brazil noted on other frequencies, i.e. Rádio Nacional in Brasilia on 980 with S9+20dB and Rádio Metropolitana in Fortaleza on 930 kHz with S9+10dB].